•Mission Rabies is a UK-based charity and international NGO which was founded in 2013 with one aim, eliminate rabies. •Over 99% of human rabies cases are caused by an infected dog bite. Once symptoms of the disease develop, it is always fatal. •Every year, millions of healthy dogs are inhumanely killed for fear of this deadly disease. However, this doesn't halt the spread of rabies, which causes the deaths of around 60,000 people a year – the majority of which are children under 15. •Mission Rabies is going to change that. •Science shows that the most effective long-term rabies control strategy is through vaccination of dogs in endemic areas. •Following World Health Organisation guidelines, Mission Rabies run mass canine vaccination drives and educate local communities on rabies prevention .Their results speak for themselves with the number of human rabies deaths falling every year. Thank you so much to Pascal, Andrew, and all the team at A J Tours, for the wonderful trip that they arranged for us in September/October 2018, having travelled in Uganda before many times, this was truly the best trip ever. 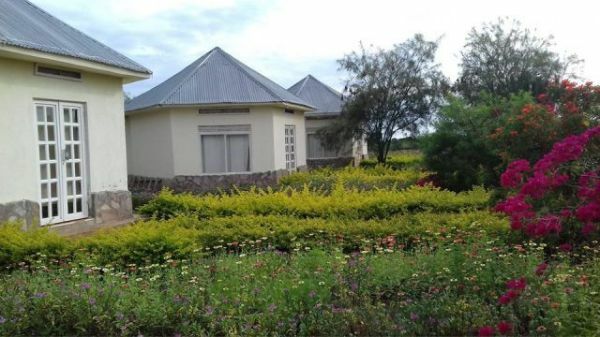 We travelled across Uganda to Murchison Falls, via The Rhino Sanctuary at Ziwa, scenery, and wildlife was stunning, and the accommodation arranged was comfortable. One of the highlights for us was Pascal's new Euphorbia Lodge in Queen Elizabeth National Park, we could have sat in the gardens all day just watching the beautiful birds coming and going, we also saw many animals in the area, including Elephants, Wart Hogs, and Monitor Lizards. We were taken high into the mountains of the Bwindi Forest National Park, where we have visited many times before, to see all our friends in the area, visiting also the schools we help to sponsor, at Buhoma, and Karangara, the accommodation here too was excellent. We would definitely travel with A J Tours again, in fact we are already planning our next trip in 2020, even though we are not getting any younger, at 66 years of age, we feel that with Pascal and the team, we can continue to visit Uganda for several years to come. I cannot thank Pascal and Andrew and the whole AJ Tours team enough for the amazing support they have given me, with my various charity projects, working as an Honorary member of the Kabale Rotary Club in Uganda. Whatever I ask, whether it is organising my twice yearly trips, delivering items such as books and clothes to the schools I work with or giving support to our children, nothing is ever too much! "if anyone is considering a trip to Uganda ( and if you're not, why not???) I can thoroughly recommend AJ tours, owned by Pascal. They will look after you brilliantly"
My visit to Uganda in July 2018 was a wonderful trip, in no small part thanks to AJ Tours and the team at Euphorbia Lodge. I visited Uganda with Mission Rabies for their dog vaccination project and stayed on for a trip arranged by AJ Tours, which included a visit to Lake Mburo National Park and a morning observing a local vet working with some beautiful cows. The accommodation at Euphorbia Lodge is simple but comfortable and surrounded by wildlife-sitting on the loo watching the weaver birds outside was fantastic! Other birds observed within the grounds included water thick-knee and grey longbill along with an abundance of butterflies. A short walk through the bush is Lake Bunyampaka, a salt lake, worked by the residents of Kasenyi Fishing Village-the closest settlement to Euphorbia Lodge. 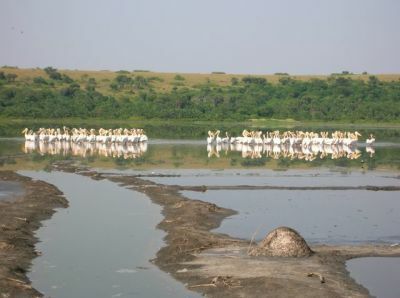 The lake has flocks of greater flamingo and great white pelican and is visited by a variety of large mammals, including elephant. During the walk we saw a variety of wildlife including warthog and waterbuck. Vehicle and walking safaris guarantee a range of wildlife sightings as you are nestled within Queen Elizabeth National Park. I was so grateful that the AJ Tours team were able to arrange a custom itinerary, based around my budget and interests-I had a wonderful time.